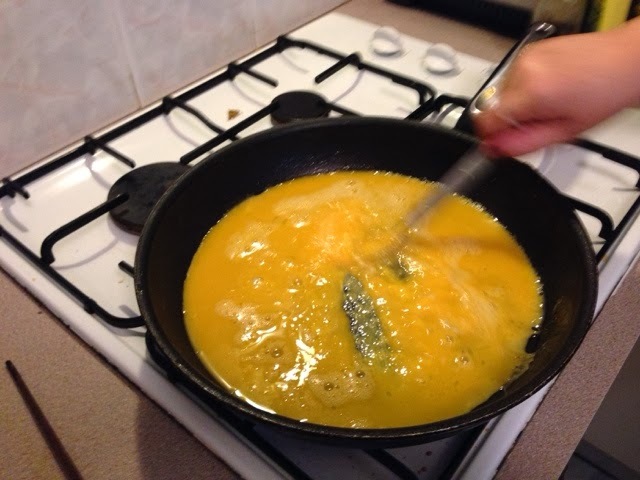 Last week I had the great pleasure of discovering the Just One Cookbook Japanese cooking blog. My goodness. I also bought Nami's ebook. 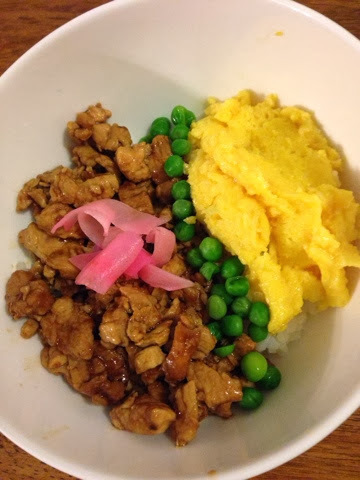 If you're interested in trying Japanese cooking, head on over to her blog. Seriously. I'll still be here when you pull yourself out of Japanese Cooking World ... "Was I gone long? Where am I? Who are you? 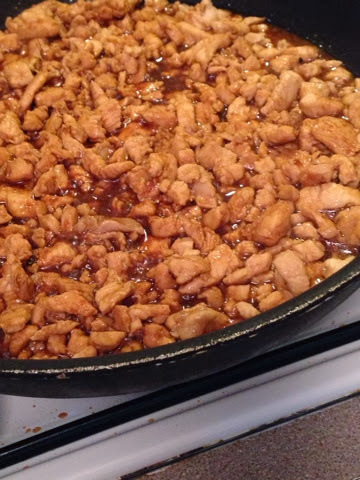 ... "
So on the weekend I made Tori Soboro Don. The online recipe has extensive step-by-step photos, and is very clear. 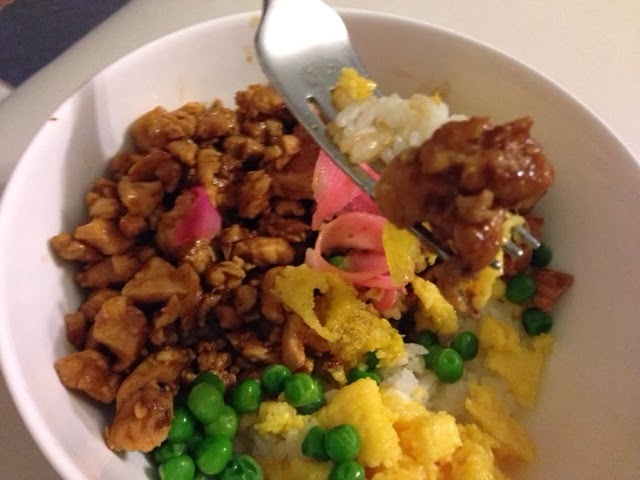 It's a chicken donburi recipe — donburi means 'rice bowl dish', and refers to any Japanese meat /veg sort of stew, served over rice. Donburi is often shortened to 'don'. This recipe is basically fried chicken mince, and scrambled eggs, with peas, over rice. I couldn't get a hold of chicken mince, so used chicken breasts and diced them finely. Worked quite well, actually! The chicken is cooked with ginger, sake, sugar, mirin, and soy sauce. I actually cut back on the sugar a bit, and the result was still quite sweet. The whole mixture gets cooked down slowly until it's all gooey and delicious. Then you beat together eggs with more sugar, and fry it, breaking it up with (ideally) a bunch of chopsticks. Having a severe chopstick shortage in the house at the time (now remedied, you'll be relieved to hear! 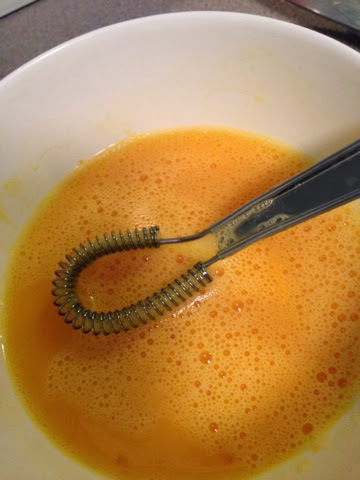 ), I used a mini whisk instead. 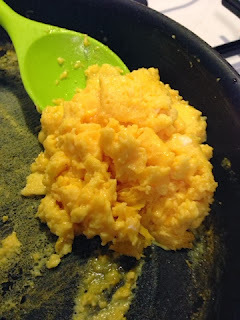 Yummo, who knew that sweet scrambled eggs could be so delicious! Lastly you defrost some frozen peas, and get creative in the bowl ... rice first, then the chicken and egg, and a sweet line of peas. I wasn't as tidy with my line of peas as Nami, but it still looks appealing. Top with pickled ginger. Goddammit Blogger, why you no align things properly! Excuse the derpy layout ... what Blogger says is 'centered' clearly isn't what a human would think is centred. Verdict? Huge hit with the whole family. The meat is sweet, caramelised, and salty, and the ginger gives the perfect contrast. The egg and peas are tasty too, with the chicken and rice. Very very nommy! And so pretty too! Despite the aforementioned lack of chopsticks. Now remedied. Definitely going to give this a go. Though minus the sake, we don't have any and don't really like it - but love the sweet and salty idea! Thank you SO much for purchasing my eBook! I hope you enjoy cooking Japanese food at home. :) I'm happy to hear you and your family enjoyed this dish. Soboro don is usually on sweeter side (which is why lots of kids love this dish, or even to eat at room temperature so good for bento box), but please adjust to your liking. :) And yes, you can skip sake. We use it to remove the gamey smell from meat. :) Thank you for linking back to my post!